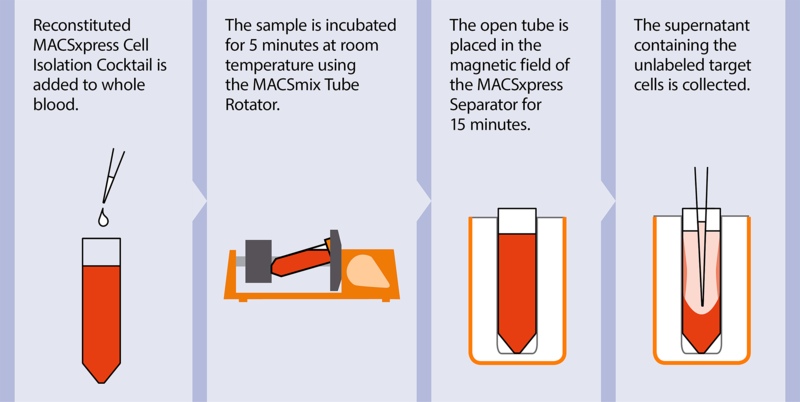 In this application protocol, we describe an easy and convenient technique using MACSxpress® Technology for the efficient purification of untouched immune cells from human whole blood in 20 minutes. Up to 30 mL of whole blood can be processed in a single tube, enabling the fast isolation of a large number of NK cells for downstream applications. The procedure does not require density gradient centrifugation, which minimizes pipetting steps and aerosol formation for a high level of safety. Buffer: Phosphate-buffered saline (PBS) pH 7.2, supplemented with 0.5% human serum albumin (HSA) and 2 mM EDTA. Keep buffer cold (2–8 °C). Degas buffer before use, as air bubbles could block the column. ▲ Note: HSA can be replaced by other proteins such as bovine serum albumin, fetal calf serum or human AB serum. Buffers or media containing Ca2+ or Mg2+ are not recommended for use. (Optional) Fluorochrome-conjugated antibodies for flow cytometric analysis, e.g., CD45-VioBlue® (# 130-092-880), CD3-FITC (# 130-080-401), and CD56-PE (# 130-090-755). Learn more about our antibodies and dyes. This protocol includes instructions for preparing necessary reagents and materials and then carrying out each step. Isolate NK cells from up to 30 mL whole blood using the MACSxpress® Whole Blood NK Cell Isolation Kit, human. The kit enables isolation directly from blood in a single tube and in 20 minutes, without the need for density gradient centrifugation. Aggregated erythrocytes and platelets sediment, while magnetically labeled non-target cells are retained in the magnetic field of the MACSxpress Separator. The supernatant containing the target cells is then collected. Follow the protocol of the kit data sheet. Isolation of NK cells from human whole blood using the MACSxpress NK Cell Isolation Kit, human. Non-target cells and other unwanted cells or cell fragments either sediment or are retained, while the supernatant containing the NK cells is transferred to a fresh tube. Non-target cells and other unwanted cells or cell fragments either sediment or are retained, while the supernatant containing the NK cells is transferred to a fresh tube. Efficiency of large-scale NK cell isolation. Mean NK frequency in whole blood samples from 7 healthy donors was 4.8%. NK cells were isolated from 30 mL of anticoagulated whole blood using MACSxpress technology. Cells were recovered in a volume of 25–30 mL of supernatant. The average purity of isolated NK cells in relation to white blood cells amounted to 88.9%, with a recovery of 75%. Red blood cells and platelets were reduced by ~99.7% and >99.9%, respectively. Proportions of NK cells were determined by flow cytometry using the MACSQuant® Analyzer. Removal of erythrocytes and platelets was quantified using a Sysmex® KX-21N automated hematology analyzer. Mean NK frequency in whole blood samples from 7 healthy donors was 4.8%. NK cells were isolated from 30 mL of anticoagulated whole blood using MACSxpress technology. Cells were recovered in a volume of 25–30 mL of supernatant. The average purity of isolated NK cells in relation to white blood cells amounted to 88.9%, with a recovery of 75%. Red blood cells and platelets were reduced by ~99.7% and >99.9%, respectively. 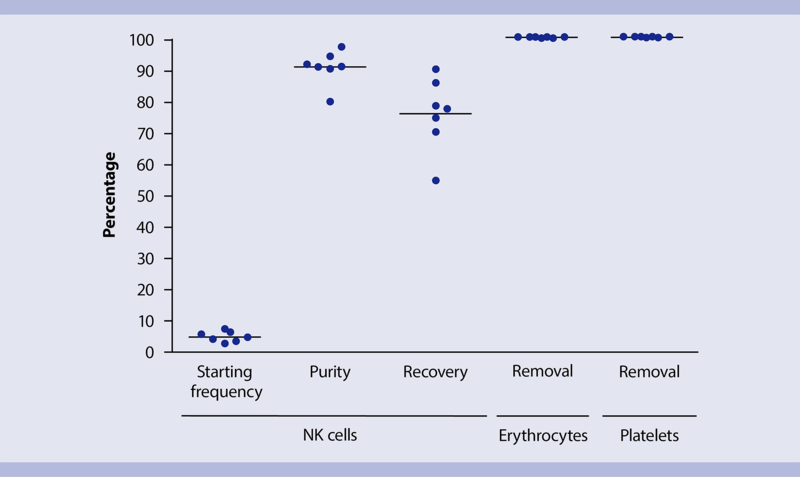 Proportions of NK cells were determined by flow cytometry using the MACSQuant Analyzer. Removal of erythrocytes and platelets was quantified using a Sysmex KX-21N automated hematology analyzer. 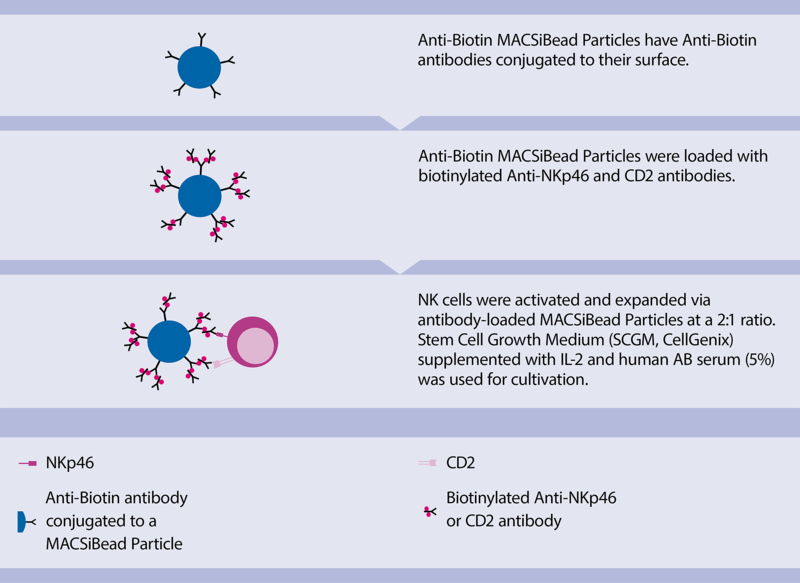 For NK cell expansion, PBMCs or isolated NK cells are cultured for up to 20 days in the presence of Anti-Biotin MACSiBead™ Particles loaded with CD2 and CD335 (NKp46) antibodies from the NK Cell Activation/Expansion Kit, human. Follow the protocol of the kit data sheet. Activation and expansion of NK cells. Cells are cultured in the presence of MACSiBead Particles loaded with biotinylated CD2 and CD335 (NKp46) antibodies. Cells are cultured in the presence of MACSiBead Particles loaded with biotinylated CD2 and CD335 (NKp46) antibodies. Efficient expansion of NK cells. Culturing isolated NK cells for up to 20 days in the presence of MACSiBead Particles loaded with CD2 and CD335 antibodies resulted in an approximately 300-fold expansion (A). 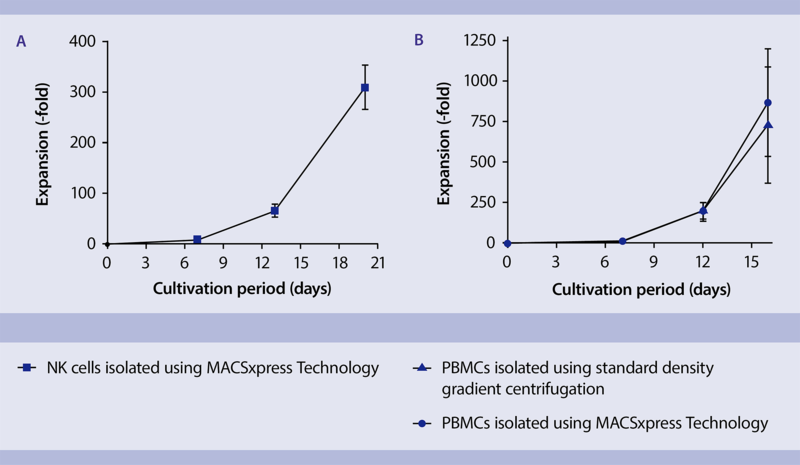 Starting with PBMCs resulted in an NK cell expansion of 500–1,000-fold within 16 days (B), regardless of whether PBMCs were isolated by MACSxpress technology or density gradient centrifugation. Data shown are the means +/– SEM from two experiments with samples from two healthy donors. Culturing isolated NK cells for 20 days in the presence of MACSiBead Particles loaded with CD2 and CD335 antibodies resulted in an approximately 300-fold expansion (A). 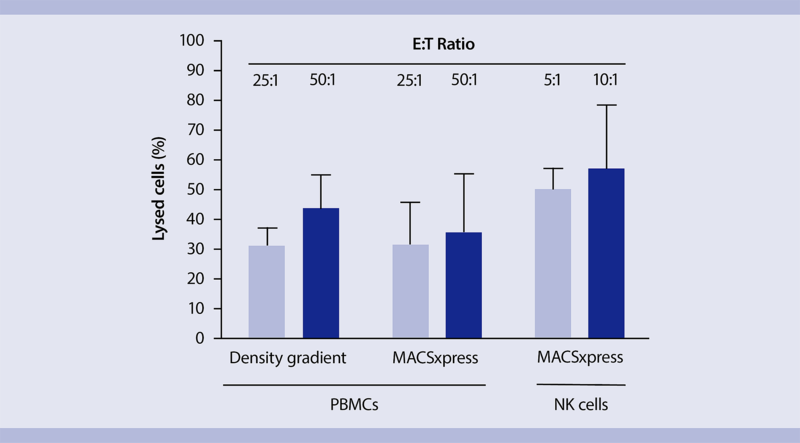 Starting with PBMCs resulted in an NK cell expansion of 500–1,000-fold within 16 days (B), regardless of whether PBMCs were isolated by MACSxpress technology or density gradient centrifugation. Data shown are the means +/– SEM from two experiments with samples from two healthy donors. The cytotoxicity of the isolated NK cells is determined by analyzing their capacity to specifically lyse K562 target cells. The NK cells and K562 cells are co-cultured at different ratios for 4 hours. Lysed K562 cells are then labeled with a DNA staining solution for flow cytometry analysis on the MACSQuant® Analyzer. NK cell cytotoxicity determined as capacity to lyse target cells. To induce tumor cell killing, the effector NK cells are cultured with target cells (K562 cells) for 4 hours. Lysed cells are subsequently quantified by flow cytometry. NK cell cytotoxicity determined as capacity to lyse target cells. To induce tumor cell killing, the effector NK cells are cultured with target cells (K562 cells) for 4 hours. Lysed cells are subsequently quantified by flow cytometry. Fully functional NK cells with strong capacity to lyse K562 cells. Isolated NK cells and PBMCs co-cultured with K562 cells resulted in high percentages of lysed target cells after just 4 hours. Isolated NK cells showed high lysis capacity at low effector:target (E:T) ratios. Isolated NK cells and PBMCs co-cultured with K562 cells resulted in high percentages of lysed target cells after just 4 hours. Isolated NK cells showed high lysis capacity at low effector:target (E:T) ratios. Soltenborn, S. et al. New technology for fast isolation of NK cells from human whole blood.